He Excelled at Them All! Rex Kent was born on August 19, 1889 in the unincorporated community of Edson, nine miles east of Goodland in Sherman County, Kansas. He was the oldest of three children born to Rufus Absalom Kent (1860-1939) and his wife, Mary D. “Mollie” (Maris) Kent (1860-1941). Kent attended the Wentworth Military Academy at Lexington, Missouri in 1906 and 1907. He was married in 1912 at Denver, Colorado to Clara May “Plum” Thorsen (1888-1963) and they had a son, Robert Arthur “Bob” Kent (1915-1980). Kent was also the father of Constance Clara (Kent) Taylor (1927-2012). In 1910, Rex Kent was residing with his parents at Goodland, Kansas and working with his father as a clerk in a local bank. Kent was shooting craps in a local establishment one night when another player in the game was wiped out saying that he had lost every dime that he had; everything. Later that night, Kent approached the man and told him that he should not play the game if he could not afford to lose. Kent then returned all of the man’s money to him and even a little extra. 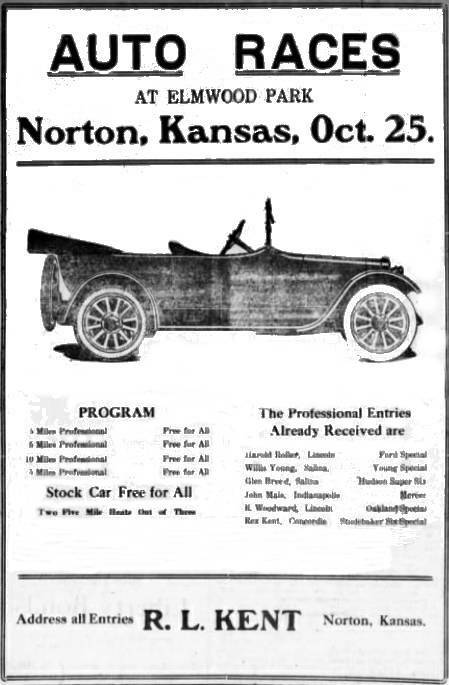 In October of 1914, Kent and a partner, Fred Strohwig (1884-1960) of Norton, Kansas promoted motorcycle races at the Sherman County Fairgrounds in Goodland. The event was so successful that the dual organized and then promoted a series of flat track motorcycle races beginning at the fairgrounds at Goodland, Kansas on May 24-25, 1915; then moving to the fairgrounds at Norton, Kansas; Smith Center, Kansas and ending up with a 100-mile feature race at the Kansas Free Fairgrounds in Topeka, Kansas on May 31, 1915; that last event paying a purse of $400. Again, they promoted another big motorcycle race at Norton on September 23-24, 1915 that they billed as the “state championship”. Entries came from over a large section of the Midwest and these races too, were a big success. In January of 1915, Kent moved his family to Norton, Kansas where he and a partner, Earl C. Craige (1886-1963), opened the new Kent Garage. The garage served as a new car agency for Studebaker automobiles with a territory that covered 14 counties in northwestern, Kansas. By May of that year, he had expanded his new car offering there to also include a Dodge agency. He also became an active member of the Norton Gun Club. On July 6, 1915, the police in Norton, Kansas got a call that some men had torn down some new gates and about ½ mile of new fencing about ten miles east of Norton. Bloodhounds were quickly brought in by train from Phillipsburg, Kansas. Kent met the train and sped both the dogs and the officers to the crime scene but the perpetrators had already made their getaway. At the request of the Studebaker corporation, Kent organized a four-day endurance run that covered 1,000 miles of his dealership’s territory. The event began November, 1 1915 with Rex Kent driving a new Studebaker “Six” the first day of the run; his father drove the car the second day; and then Rex drove the final two days. The evening of the final day, Kent and some of his employees were celebrating at a garage that Kent owned at Smith Center, Kansas when a pistol that one of Kent’s employees was holding, went off striking Kent in the calf of one of his legs. After the wound had been treated by a local doctor, Kent was sent home to Norton that same night. Finish: 3rd in the 1st heat race for stock cars behind Clarence F. Jackson of Smith Center, Kansas in a Studebaker “Six” and A. J. Cleveland of Salina, Kansas in a Hudson “Super-Six”. 3rd in the 3rd heat race for stock cars behind A. J. Cleveland of Salina, Kansas in a Hudson “Super-Six” and Clarence F. Jackson of Smith Center, Kansas in a Studebaker “Six”. In 1917, Rex Kent and his father opened a tire repair business in Beloit, Kansas and then sold their Studebaker agency and garage in Concordia, Kansas to the Studebaker Corporation of America which made it a subsidiary of the Kansas City, Missouri branch of the company. The Kents retained their Kent Tire Repair Shop in Beloit, Kansas and opened a large, new Studebaker dealership at Goodland, Kansas to service the Northwest district of Kansas for the company. Finish: 3rd fastest 2-lap time in time trials of 1:15.2 which was slower than the time trial times of Harold Roller of Abilene, Kansas in a Ford and Johnny Mais of Salina, Kansas in a Mercer. 2nd in the 1st 3-mile heat race in the 1st division of heat races behind Johnny Mais of Salina, Kansas. 2nd in the 2nd 3-mile heat race in the 1st division of heat races behind Willis Young of Salina, Kansas in his Young special 4-cylinder Ford. 2nd in the 3rd 3-mile heat race in the 1st division of heat races behind Willis Young of Salina, Kansas in his Young special 4-cylinder Ford. Won the last two 5-mile heats of the special stripped car race. Won the special stripped car final in 6:25.5. Leslie C. Dahlberg of Minneapolis, Kansas placed 2nd in a Maxwell and Peter C. Redman of Abilene, Kansas placed 3rd in another Maxwell. 3rd in the 3-mile “finals” behind Harold Roller of Abilene, Kansas in a Ford and Willis Young of Salina, Kansas in his Young special 4-cylinder Ford. 3rd in the 5-mile “Free-for-All” race behind Harold Roller of Abilene, Kansas in a Ford and Johnny Mais of Salina, Kansas in his Mais special. Finish: These races were postponed until August 21, 1917 for an undisclosed reason. Finish: 2nd in the 1st 5-mile heat race behind Harold Roller of Abilene, Kansas in a Ford. 3rd in the 2nd 5-mile heat race behind Glenn Breed of Salina, Kansas in a Hudson “Super-Six” #1 and Harold Roller of Abilene, Kansas in his 16-Valve Roof Ford. Feature race winner: The final 5-mile race was 1st stopped and then canceled after a last-lap crash involving Glenn Breed of Salina, Kansas in a Hudson “Super-Six” #1 and Harold Roller of Abilene, Kansas in his 16-Valve Roof Ford. Finish: Won the 1st 5-mile heat race in 6:41.0 over Johnny Mais of Salina, Kansas in his Mais special. Won the 2nd 5-mile heat race in 6:04.0 over Johnny Mais of Salina, Kansas in his Mais special. Finish: 4th in the All Ford race behind Maurice Rosseter of Hollis, Kansas; Harry Larson of Concordia, Kansas and Percy Collins of Belleville, Kansas. Won the 1st heat of the “Free-for-All” race over Vic Duff of Concordia, Kansas in a Velie. Won the 2nd heat race of the “Free-for-All” race over Lloyd Sissell of Scandia, Kansas in an Overland. Was declared the overall winner of the “Free-for-All” race over Robert Cusick of Clyde, Kansas in an Overland. Finish: 2nd in the 1st 5-mile heat race of the “Free-for-All” race behind Harold Roller of Abilene, Kansas in his 16-Valve Roof Ford. 2nd in the 2nd 5-mile heat race of the “Free-for-All” race behind Harold Roller of Abilene, Kansas in his 16-Valve Roof Ford. Feature race winner: Harold Roller of Abilene, Kansas in his 16-valve Roof Ford. Finish: In the 2nd 5-mile heat race, Kent crashed his Studebaker into the back of a car driven by Pearl Marshall on the north curve. The crash tore a wheel off of Marshall’s car but that was the only damage that was done and no one was injured. 3rd in the “Free-for-All” race behind Harold Roller of Abilene, Kansas in his 16-valve Roof Ford and Willis Young of Concordia, Kansas in a Maxwell. After officials with the Drummond Motor Company had watched Kent drive some races in his Studebaker “Six”, they asked if he would be interested in driving one of their “Drummond Eight” racing cars at the upcoming races at Concordia, Kansas, so he excepted their offer. Rex Kent in his Studebaker “Six” racing car. This car was destroyed in an accident during a race at Belleville, Kansas on August 23, 1918. Belleville Telescope and Freeman newspaper. Car: A “Drummond Eight” in the professional races and a “Buick Six” in the stock car race that was owned by “Sheridan and Murdock”. Finish: 1st in the stock car race over a Stutz owned by ______ Watts and driven by ______ Smiley. 2nd in in one heat race and 3rd behind Floyd Willard of Minneapolis, Minnesota in the other heat race, both races which were won by Harold Roller. Stripped his gears at the start of the “Free-for-All” race and did not finish. Feature race winner: Harold Roller of Abilene, Kansas in his white 16-valve Roof Ford. Impressed with Kent’s performance at Concordia, Drummond officials told him that they wanted to have a new “Drummond Eight” racing car, equipped with a 90-h.p. Herschell-Spillman engine built specifically for him in the Drummond factory and they assured him that the car would be ready to compete in the races at Blue Rapids, Kansas on October 9, 1917. Again, Kent initially excepted their offer but, after a visit to the Drummond factory in Omaha, Nebraska on October 5, 1917, he learned that the race car they were proposing to build for him, could not be ready until the spring of 1918 so he returned to Kansas and continued to race his own Studebaker “Six”. No reason has been learned but Kent never did take delivery of that new “Drummond Eight” racing car and it is not known that he ever raced a Drummond automobile again. Finish: 3rd in the “Free-for-All” race in his Studebaker behind Harold Roller of Abilene, Kansas in his 16-valve Roof Ford and Johnny Mais of Amarillo, Texas in his Mercer special #24. Feature race winner: Rex Kent of Concordia, Kansas in his Studebaker “Six”. On October 20, 1917, Glenn Breed of Salina, Kansas in his Hudson “Super-Six” #1 and Harold Roller of Lincoln, in his 16-valve Roof Ford ran a best two-out-of-three series of 5-mile match races at the Lincoln County Fairgrounds at Lincoln, Kansas. The two contestants selected Rex Kent to be the official starter as well as one of the judges for those races. Breed won the first two races to be declared the overall victor. Finish: These races were postponed until October 26, 1917 due to unclimactic weather. Finish: 2nd in time trials with a 2-lap time of 1:11.5. The fastest time trial of 1:11.0 was run by Willis Young Young of Concordia, Kansas in his 16 valve, 4-cylinder Young special. 2nd in 5-mile “Free-for-All” behind Willis Young of Concordia, Kansas in his 16 valve, 4-cylinder Young special. Feature race winner: Willis Young of Concordia, Kansas in his 16 valve, 4-cylinder Young special. Over the winter of 1917-1918, Kent designed a new race car for the upcoming racing season. He then persuaded Ray Cole, a mechanic and the proprietor of Cole’s Garage in Smith Center, Kansas, to build it for him. Cole started with a Ford body and frame that had been lightened and shortened 16 inches. He then installed a newly reworked Studebaker “Six” engine in the car. This ad appeared on page 8 of the July 19, 1918 issue of the ”Belleville Telescope and Freeman” newspaper. The picture was probably staged and taken at the North Central Kansas Fairground. 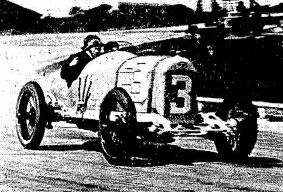 The driver of car #3 is Rex Kent of Concordia, Kansas who both promoted these races and competed in them in a Studebaker “Six”. The driver of #24 is Johnny Mais in his Mais special. Finish: Kent won the feature race followed by Lafe Cole of Cedar, Kansas driving a 16-valver Ford special. Feature race winner: Rex Kent of Concordia, Kansas in his own shortened Ford chassis equipped with a Studebaker “Six” engine. Finish: Won 4 races and finished 2nd in the 2nd race. No names of any of the other competitors were given in the newspaper account of these races. 1st in the “Free for All” race over Ray Cole of Smith Center who was driving a Ford special. Finish: Kent won several of these races himself. Lafe Cole of Cedar, Kansas drove a 16-valve Ford special to a 2nd place finish behind Kent in the “Free-for-All” race. Kent finished 3rd in the feature race behind 2nd place Lafe Cole of Cedar, Kansas in a 16-valve Ford special. Feature race winner: Names of the race winners in these races have been located to date. Finish: Leading the 14-car, 10-mile “Free-for-All” when the differential broke on his Studebaker “Six” just 300-yards short of the finish. Newspaper accounts of the event do not name the eventual winner of the event. Kent was driving his Studebaker “Six” powered Ford race car on a highway near Clay Center, Nebraska on August 8, 1918 when a speeding motorcycle crossed through an intersection in front of him. He swerved in an attempt to miss the motorcycle but drove into a ditch and the car overturned throwing both of its occupants from the vehicle. Kent received a sprained arm in the accident but his passenger, Ivan Carver from Iowa, only lived for a few hours. The motorcycle rider received a badly injured ankle. Car: Kent’s own shortened Ford chassis rebuilt and lightened by Ray Cole of Smith Center, Kansas in the spring of 1918 and equipped with a Studebaker “Six” engine. Finish: Kent won two of these races and finished in 2nd place in two others, but which race he finished where in, has yet to be learned. Finish: Kent won two preliminary races and finished 3rd in another one. He was leading the field in the 25-mile feature race when a bracket on his gas tank broke which, somehow, caused the car to flip end-for-end. Finish: 2nd in the 1st 3-mile heat race behind Harold Roller of Abilene, Kansas who was driving his 16-valve Roof Ford. 2nd in the 1st 5-mile heat race behind Harold Roller of Abilene, Kansas who was driving his 16-valve Roof Ford. The overall victory was awarded to Harold Roller who won 2 of the 3 heat races. Finish: 2nd in the 1st 5-mile heat race behind Harold Roller of Abilene, Kansas who was driving his 16-valve Roof Ford. 2nd in the 2nd 5-mile heat race behind Harold Roller of Abilene, Kansas who was driving his 16-valve Roof Ford. Kent’s Studebaker “Six” powered Ford went out of control on a turn during the 3rd 5-mile heat race and crashed through a fence on the infield while turning completely over three times. He was thrown from the car and was unconscious for a couple of hours. His injuries were considered minor though as he only received some bruises and a shoulder injury. Five spectators, who were sitting on the banking on the inside edge of the racetrack, were injured in the accident including one who lost his teeth and two others who suffered broken limbs. Lawrence Levendofsky (1860-1918), a local farmer, was also killed in the accident. The remainder of the races were canceled and Harold Roller, having won each of the preliminary races run so far that day, was declared to be the overall winner. 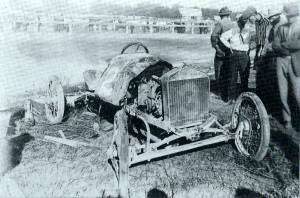 Rex Kent’s Studebaker “Six” racing car after it was destroyed in a crash on the infield at the North Central Kansas Fairgrounds at Belleville, Kansas on August 23, 1918. Kent was entered in races at Oakland Park at Salina, Kansas that were also run on the afternoon of September 6, 1918, but he did not compete in those. Kent came down with a bad case of influenza in the fall of 1918 so he went home to rest and did not race anymore that year as the flu had been particularly vicious that year. On February 15, 1919, the Concordia, Kansas police raided an elaborately fitted poker room in downtown Concordia. The bomb proof room, supposedly police proof as well, had been modified to block sound and light from being noticed on the outside and one had to pass through three locked doors to gain admittance to the elaborately furnished room. Seven players were arrested; one of which was Rex Kent. Five days later, Kent plead guilty to the charges in police court and was fined $25 for illegal gambling plus another $60 for maintaining a room for that purpose. He also had the pay court costs in addition to the fines. In March of 1919, Kent moved to Norton, Kansas where he purchased a Buick garage, adding that to his other business holdings in Denver, Colorado and Concordia, Beloit, Russell, Norton and Goodland, all in Kansas. Within a year, he had also acquired a 40-room hotel that he renamed the “Kent Hotel”, in Norton and had become an active member of the Isis Shrine there. These races were organized and promoted by Roy Ivanhoe Pickering and ______ Johnson. Finish: These races were postponed until May 3, 1919 due to rain. Finish: Bullock won all three races over Charles “Butch” Lebsack of Otis, Kansas who was driving a Fronty Ford owned by Lenard Kerbs who was also from Otis, Kansas. Finish: 3rd in the “Free-for-All” race behind Johnny Mais of Salina, Kansas in an Essex and Harold Roller of Abilene, Kansas in his 16-valve Roof Ford. By 1919, Kent had was performing “automobile livery” services from the Cope Garage which was a new dealership for Buick automobiles that he had opened in Norton, Kansas. In August of 1921, Kent opened the first of what became a chain of restaurants, in Smith Center, Kansas. By 1930, Kent had moved his family to Salina, Kansas where he and a partner, Ralph E. Sarvis (1891-1966), opened and operated the Kent Oil Company. Rex was also the president of the Farmers Finance Company, the Jayhawk Oil Company, the Superior Refining Company, Rogers Construction Company and owner of the Kent Coffee Shop, all of Salina. Rex and “Plum” Kent were divorced in the late 1930s and he moved to Denver, Colorado where he married Edith H. Lantz (1899-1954) from New Philadelphia, Ohio. After Edith passed away in Denver, Rex moved back to Salina, Kansas where he was elected president of the Kansas Oil Men’s Association. In 1955, Rex purchased the Milestone Motel and the Towne House Cafe, both in Russell, Kansas, to go with his Adams Motel in Denver, Colorado and the Kent Motel in Norton, Kansas. By then, his Salina company also owned a chain of restaurants and service stations in Kansas, Nebraska and Colorado. In 1957, Kent sold his Kent Oil Company, including 40 service stations, to The Vickers Petroleum Company in Wichita, Kansas. He then turned what was left of his once thriving business empire over to his son, Robert. The son did not have the business acumen of his father and each of the properties he acquired from the elder Kent eventually failed. Rex married Harriet Marie, whose maiden name is unknown, and they moved to Fort Lauderdale, Florida in 1959. On November 15, 1963, Rex and Harriet Kent, along with their 36-year-old captain of their boat, Henry Kugel, had just left the Isle of Palms near Fort Lauderdale, Florida, on their 46-foot Chris-Craft cabin cruiser named the “Jayhawk”. Kent had been having trouble with a fuel gage on the boat and was adjusting that when he apparently made a wrong adjustment causing a huge explosion. The boat sank quickly and all three aboard were forced to swim to shore. They were all taken to the Broward General Hospital where they were treated for their injuries. Rex’s injuries were primarily to his legs and were quite serious. Late in May of 1964, Rex and Harriet traveled to Morehead, North Carolina where they picked up a new cabin cruiser they named “Jayhawk Junior” and spent the rest of the summer months leisurely cruising it back to Fort Lauderdale. Kent passed away in Broward General Hospital in Fort Lauderdale, Florida on October 13, 1964 due to the difficulty he was having breathing. His body was cremated and his widow scattered his ashes over the water at Fort Lauderdale. Rex Kent was a complicated man with great charm and a passion for living. He was a stylish dresser with good looks and charm that attracted women. He loved to gamble and took great risks in his life. He was faithful to his friends and was willing to attack those he opposed. His friendship to those he supported was absolute. He loved his children, although he was disappointed with son Robert’s work ethic and he had very little contact with his grandchildren.